Where is the floor tile from? is it a ceramic? It looks very much like Concrete porcelain. It could be concrete (but I doubt it), Concrete porcelain looks are very popular. Was the metal vanity base finished in any special way to resist water? Thanks Summer, read all the comments. Great job. what was used for the floor tile and where was it purchased? Where did u get the subway tiles? - And how much are they? Love the tile! What size? Love the subway tiling. What color is the grouting? Do you know the size of the grout spacing used? Really beautiful. - I know you already answered a question about waterproofing the steel. Would it be possible for you to tell me the name of the product one can use? I live in the middle east and have made a vanity much along these lines but have not figured out how to make it waterproof. Your help would be appreciated. Where can I find that Black iron mirror? I have been looking for a shower door like that, can you tell me where I would find it? Love the whole bathroom, but that mirror, wow! may I ask the source? Love the sconces do we know where we can find them? Where can I find a vanity like this one? You can find a similar product here: http://www.kbfurnishings.com/industrial-modern-vanity.html. Please feel free to contact us with any questions! vanity - Is this a custom vanity or can I find it in a store? If your interested, I would be able build a custom vanity similar to this. Who Made the shower enclosure? I would love to "redo" a bath using your pic! What an inspiration! I Googled "Casa Midi" and am finding nothing but furniture - do you have any suggestions on where to find something with a similar finish? Brilliant! Gorgeous! Which Kallista Shower head? - We are building new construction in the Inland Northwest, so inspired by your use of contrast and nod to history. This shower would match what I am doing but cannot find it on Kallista. Could you direct me? Many thanks! Where is the shower door framing from? The sink is Kohler. The vanity is custom designed by our firm in coordination with a metal fabricator. If you're looking for a designer, we of course would be happy to help. We carry a similar vanity. http://www.kbfurnishings.com/industrial-modern-vanity.html. Please feel free to contact if you have any questions! Does the white subway tile cover all of the bathroom walls? What color grout is this? Vanity? - Would you please share where this vanity is from/manufacturer? How much does the custom piece go for? I love it, the bathroom, the entire design! You can get a similar product here: http://www.kbfurnishings.com/industrial-modern-vanity.html. Please feel free to contact us for any questions. Shower floor - So I've been told that doing your shower floor any bigger than a 4 x 4 is not recommended. It looks like this floor has larger tile pieces. Was it built a certain way to get away with using larger pieces for the shower floor? I have been told to get unjointed tiles for my shower surround. What is the definition of unjointed? Do you know? I can't find it anywhere. also have been told to get 2x2 (the tile lady) for the shower floor to create more traction. Is this recommended? I prefer 4x4. What are the dimensions of the shower? I'm in love with this bathroom. What is the dark material that the vanity and shower frames are made from? Is it anodized aluminum? Also, is the vanity custom built? I should have asked -- are the floor tiles slate or cement? Faucet? - Love the faucet. Where is it from. what color grout was used? Need to know the grout color, please. Shower door - Where an I find the shower door? love the bath vanity - I can't find anything like it. Where should I look? Do you know what the floor tile is? hi Summer, it looks like you have a larger tile on the diagonal in the floor of the shower - is that a steam shower ? are there any limitations to respect for tiling a steam shower ? what brand is the shower head and arm? The showerhead and arm are actually Waterworks Henry collection, not Kallista. How can I order a shower door like that? Where did you get the hardware for the shower enclosure. Custom? To clarify - the door & frame was custom made. The shower fixture was from Kallista. Those sconces are great!! Can you pretty please share the source? Me too please! Where are the sconces from??? If you need any help with your project we would love to help so please feel free to contact us for any questions. Shower frame - Can anyone suggest where to find a similar shower frame in Eastern Canada? that would have to be a custom shower. Try checking with a local glass dealer. Vanity! - Please offer source for vanity! I've used a steel table and dropped a sink in before but I like the weight (size) of this one. Can you offer dimensions too? Thank you much! Who makes this vanity??? - Who makes this vanity??? Who is the designer? - Does anyone know who the designer is? Shower tile - Would you be able to tell me who makes the white shower tile? How I love your floor tile....would you please let us know what it is? What is the counter top made of...material and color? I would also like to know about the counter top. Where can I find something similar? Shower door - Is the shower glass custom? If not, where can I find it? Vanity - Can I have more information on the vanity - is it custom? who makes the metal vanity and is it available? Next step - I feel good bc I just did this very same thing w subway tile and gray grout. I love the look, but my home is a 1938 Cape Cod and the bathroom is small...I need storage. Suggestions? can you provide the tile size? Is it Ann Sacks 3x6 or 4x8? What are the floor tiles? What type of wood is on the ceiling????? Where was the shower head purchased? where can I buy that shower enclosure? - I’m interested in this shower enclosure and I don’t know where can I find it ? Where did you purchase the vanity? Shower Door Hardware - Hi... Can you share the manufacturer and collection for the shower door frame? Thanks! what would you call the style of this bathroom? - Help me! What “style” would describe this bathroom?? Can you tell me who makes the wall sconce? What would you call the style of this bathroom? Similar sink? - Any recommendations for a similar style sink but with double vanity? Grout - What color grout is this? Source for polished basin pipework in gold? the shower door? - Where did you get the shower door? Wooden Ceilings!! How was the wood preserved... - How was the wood preserved to remain intact even when exposed to extreme humidity typical in showers? Where can I find such wood? How much do they cost? love this bathroom! was the metal work for the shower custom as well? - If not, can you point me to where I would find if? If yes, what do I tell a welder to get this look? Tile Floor - Could I get the information on the tile floor? The dark Gray. What is the color of the grouting on the floor? Where did you find the mirror? - Hi there, love the mirror with the leather strap - do you know where it was purchased? Thx! Stunning - Black grout tied everything together perfectly. The vanity - Can you tell me where you got this vanity please? It's beautiful. Love vanity. What is the source? Mirror - Where can I get this mirror? Where did you find black shower door frame? - Love the black shower door! Is it wood or tile for the base trim? Ceiling - What kind of wood or materials were used on the ceiling for this bathroom? Bathroom remodeling - How do I order from you guys? Tile size and ceiling material - What size tile did you use in the shower? And what material was used for the ceiling? Shower Door - Who is the manufacturer of the glass door? brass plumbing - Where did you source the brass plumbing underneath the sink bowl? Thanks! Tile trim: - What did you use for the tile trim on the outside corner beat the shower? Is a piece of tile or some other material? Tiles - What size are the tiles, and are they glossy or matte? Shower frame - May I ask where I could buy this shower frame? Grout - What is the color of the grout on walls and floor? Mirror: can you provide where to buy? Thank You - I'm looking for this type of mirror for my half bath- thank you if you can provide manufacturer- where to buy. What are the floor tiles? - Brand and colour please. what color is the floor grout? Thank you! What is the material of the black frame - Also who makes those shower doors? Shower door details...please! - Shower door details? Grout color - Fantastic bathroom! Would you be able to tell me the grout color used for the subway tile? Where is the vanity from? Bathroom - Where can I find this vanity? Where can I get the vanity? - Where can I get the vanity? Shower - What are the dimensions please? MIRROR! - Dying to find a metal black mirror. Where is this one from please? Thanks! Please - Please let me know brand and where to buy the shower door. Thanks ! 14. Big change: Try a chic black and white scheme. Pair white subway tile with black or charcoal-gray grout for a cool (and surprisingly affordable) look. Choose simple gray tile floors and black accents on the shower and mirror frames, then bring the glamour in with shiny brass sink and shower fittings. Black floor and white wall tiles again. Amazing. 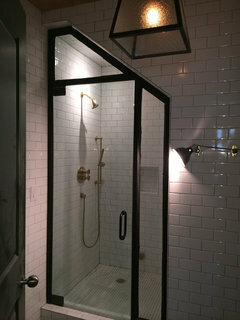 Steam shower, glass and metal door. Floor. blend of white grey and black ? ?